The main operating elements on a chronograph are the crown and the pushers. The crown is used to set the correct time, and in case of a mechanical wristwatch to wind the movement. The pushers are used for starting, stopping, and resetting the chronograph functions of the watch. These operating elements basically consist of the visible piece of the crown and chronograph button and a shaft which connects them to the movement. One of the major challenges during the construction of the crown and pusher system was to find a solution to seal the operating elements against the ingress of moisture and dust. Conventional systems make use of two O-ring gaskets made from an elastic material such as Nitril™. The longevity of these gaskets is to a large extend determined by the quality of the material and the friction between the stem and the O-ring. This friction factor increases the wear and ultimately leads to worn out and leaking sealing elements. After extensive research a solution to the problem was found– the Damasko lubrication cell. Once again the concept for this unique element is a miniaturised design derived from industrial engineering. 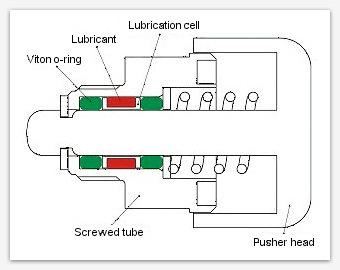 The lubrication cell is basically a tube made of Damasko patented hardened stainless steel which is screwed into the drill holes for the crown and the pushers. The cell is filled with a synthetic viscous lubricant and sealed with two innovative Viton™ elements which prevent the filling from leaking or migrating. The lubricant fills the microscopic surface roughness of the polished crown and pusher stem and eliminates friction and wear. Our lubricant system offers a longevity of gaskets and operating elements which is second to none. The Damasko gasket system and lubrication cell are patented.